Today, a record which would have fooled me. If I didn't know Sammy Marshall's voice (disguised here as Sonny Marcell), and didn't know about song-poems, the first side of this record is competent and professional enough, including the lyrics and melody, that it would have convinced me it was a legitimate release aimed at the country market of the early or mid 1960's. It's not that it's necessarily all that great, and it certainly doesn't have that special something that either makes a song-poem wonderfully weird or that makes a legit record sound like a hit, but that's actually sort of why it stands out to me. The lyrics all work, at a level rarely heard on a Globe company song-poem, and the performances all fit well. This sounds like a genuine (but failed) real label release. Does anyone else hear that? I'm not sure what the story is on Modern Records. 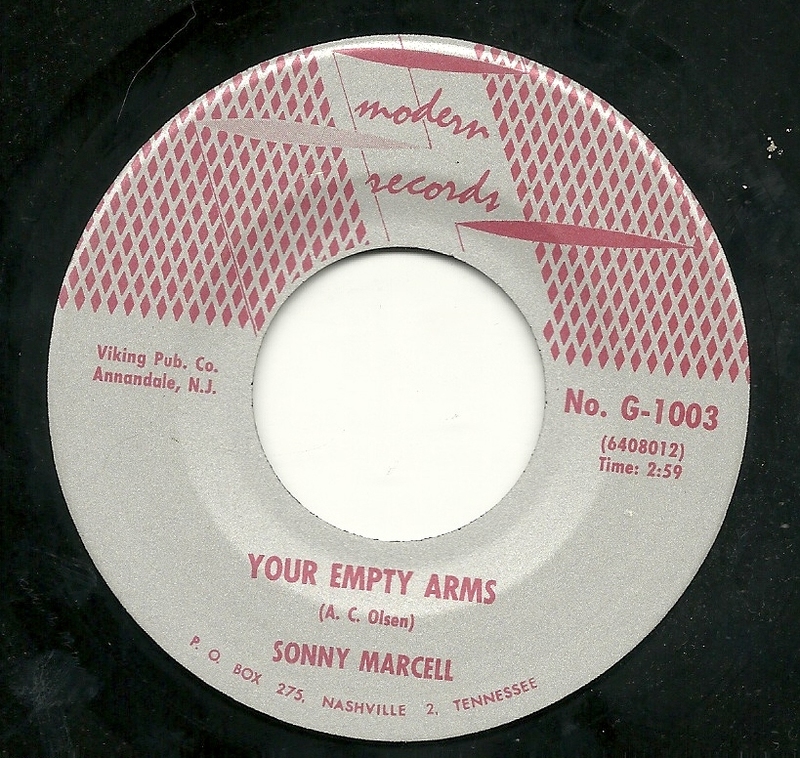 I was inclined to think that the songwriter here, A. C. Olsen, set up the label with the help of the Globe song-poem factory, but the only other documented release on the label was written by someone else. Perhaps a few friends in the Nashville area set up the company. Whatever the story, nothing I said about the A-side applies to the B-Side, "Your Empty Arms". 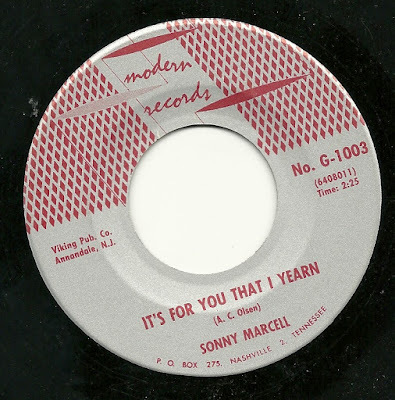 The opening guitar is slightly out of tune, the arrangement is bland, the lyrics are both clunky and they have been given melodic choices which play up that clunkiness, before those involved gave up completely and have Sammy/Sonny start talking the words. But more than anything, there is an edit at the 1:16 point which is probably the worst edit I've ever heard on a song-poem record. It results in a measure with seven beats, and which clearly cuts from one take to a different one, one with a different production sound and which is in just a tiny bit lower key (maybe an eighth of a tone). Given what it is that appeals to those who collect song-poems, I wouldn't be surprised if this half-assed side is the more popular of the two, among those listening to today's post. 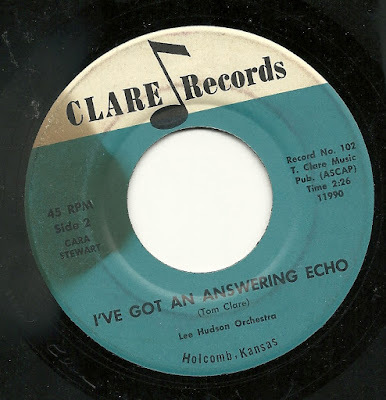 Last week, I shared the story (well, speculated is a better term) of Tom Clare and his eponymously named record label, and offered up what may very well have been the first record on that label, all of which you can find here. 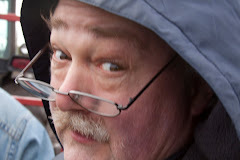 At the time, I commented that Mr. Clare seemed to have the traditional purpose of Leap Year wrong, in that it was not prime time for men to seek a mate. But I also indicated that there were reasons to think he knew full well of the tradition of women pursuing men during Leap Year (and specifically, on Leap Year Day). That proof is here, on what may have been the second release on the Clare label (and for all we know, there may only have been two releases. This time, it's my beloved Cara Stewart, again with the supremely tasteful and lovely backing of Lee Hudson, singing "It's Leap Year (I'm Gonna Get My Man)". This record is beat to hell, but still quite enjoyable. As is often the case when I use a specially themed song for a special date or time of year, I've ended up featuring the lesser of two songs: The flip side of this record is where the real action is. I've always really enjoyed "I've Got an Answering Echo", and would have to say it's the best of the four songs I've heard which resulted from the Clare. It's not unusual, in terms of the Cara Stewart/Lee Hudson team, but it does display their best qualities, being an uncommonly pretty record, with a sweet backing track and a winning vocal. And again, please forgive the dreadful surface noise on what is a very beat up record. Today we salute Kansan Tom Clare, who felt the drive to create lyrics for songs (and perhaps the music, too - who knows? ), and had the wherewithal to form his own label and contract with one of the best song-poem factories to produce his songs. 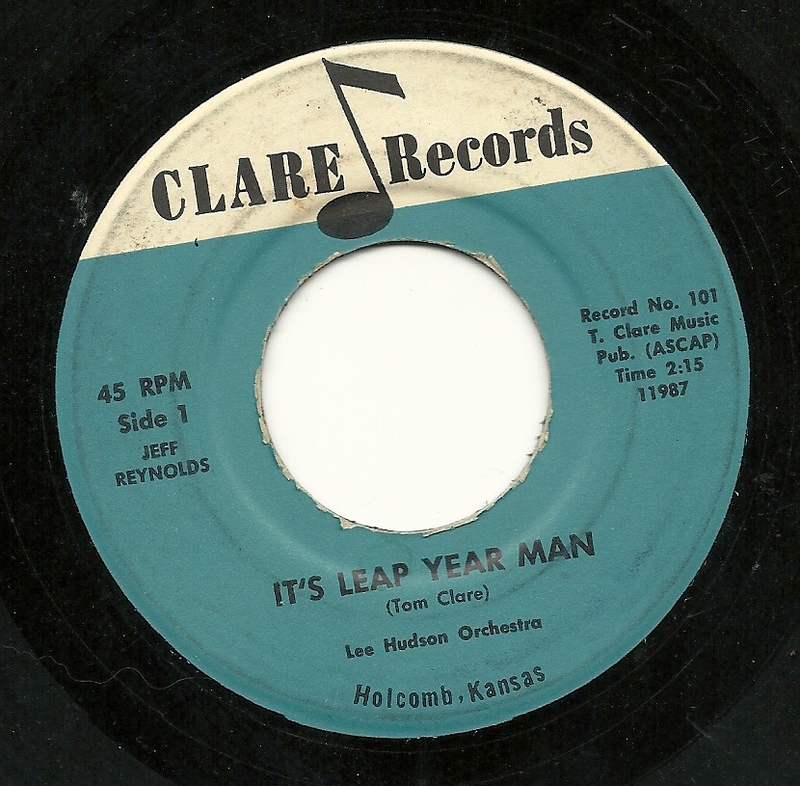 Yes, he chose the Lee Hudson company, who assigned his stable's dependable male performer, Jeff Reynolds, to record what was perhaps the Clare Records label's first release, one which is particularly appropriate in this first week of 2016 - "It's Leap Year Man". I love the sound of this record. It features perhaps the most lush, thick harmonies behind the lead vocal on any Hudson recording - that's an area in which he usually excelled, but he outdid himself here. The whole track has a wonderful, dreamy feeling to it. 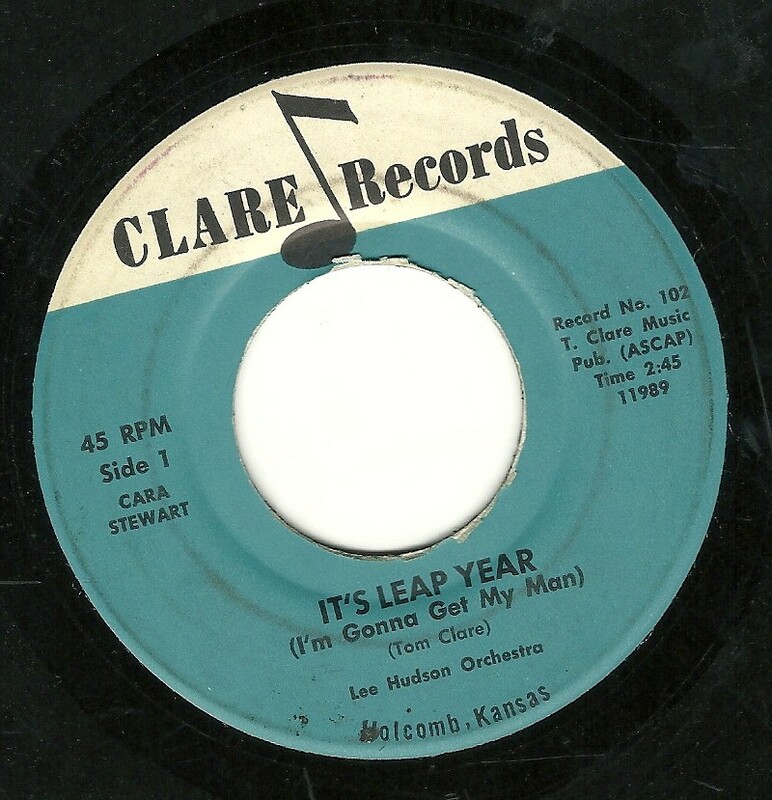 The only place it falls a bit is in the lyrics: For reasons which will become clear in another post, Mr. Clare was clearly aware of the Leap Year tradition that it is on Leap Year Day when the women can and should pursue the men. Yet, these lyrics are all about the male protagonist portraying Leap Year as a special time which will help him get the right girl. Huh? 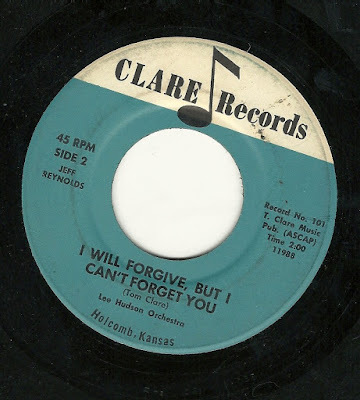 To my ears, lightning did not strike twice, in any way, on Mr. Clare's second offering, "I Will Forgive, But I Can't Forget You", which sums up the focus of the lyrics in one clunky title. This seems to go on way too long, even at a brisk 114 seconds.